Caitlin DeClercq created her Honey Bee’s Lavender Wheat with dried lavender petals, giving it a fragrant but soft aroma. A citrus tartness and slight sweetness from the honey and vanilla balance out the finish in this California resident’s brew, perfect to sip while kicking back and relaxing. This is one of the winners of the 2010 longshot competition. The competition is run by Samuel Adams. It’s a home brew competition with the winners being announced at the GABF (Great American Beer Festival). Then the Boston Beer Company (Samuel Adams) brews the winner’s beer. I make it a point each year to by a 6 pack of the Longshot winners. They are usually very unique and well crafted beers. Plus I just think it’s the coolest thing, to have a brewer commercially sell the Home Brew Beer. 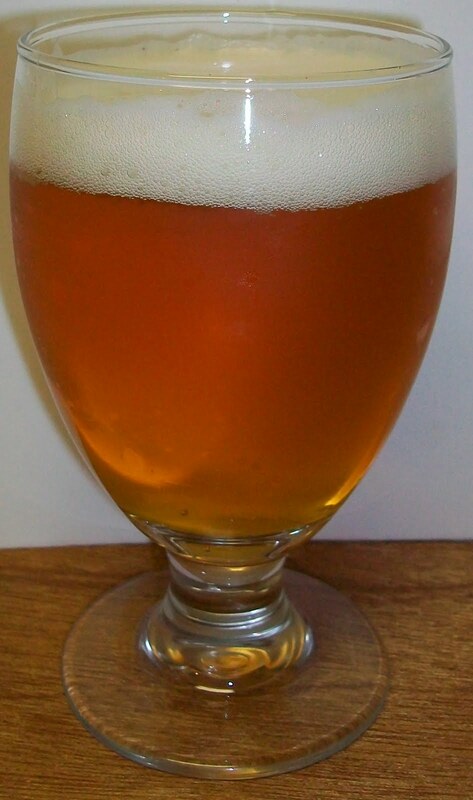 The beer pours a clear pale copper with yellow hues and a fairly rich bright white head. The nose is extremely unique with sweet light floral aromas, citrus, honey and it may be me but I am really picking up lavender along with a nice floral hops. I can’t wait to see what this taste like. There is a certain excitement in the anticipation wondering how these aromas are going to convert to flavors in this beer. I can’t wait to try this. Wow, that is one of the most original beers I have ever had. It is packed with subtle and refreshing flavors and that creamy head has added a silky mouthfeel. It’s going to be difficult describing this one. The experience starts out with a light pilsner type malt sweetness up front on the tip of the tongue. That is followed by the most pleasant effervescence over the tongue in the middle of the sip. The middle of the sip also has a building spiciness to it. At first you think that it’s a building hop bitterness but then it changes before you get to the swallow to more of a floral laden spice; very unusual. The back-end is very easy drinking with an almost effortless swallow. There is also a carbonation release during the swallow that continues to mask the flavors of the beer and keeps you guessing and anticipating the next taste. The finish is almost indescribable with sweet malts, honey, spice, citrus and a touch of floral hops to dry it. There is a sweet and refreshing aspect to the final aftertaste. The aftertaste is light but there is a lingering spicy and sweet flavors lingering throughout the mouth. All of these flavors are subtle and this beer maintains the most refreshing quality to it through the whole experience. The lacing left of the glass has been quite impressive for such a light malt ale. This is an excellent summer ale. It may be a little too sweet for me to have several of but it is a very refreshing beer. As the beer warms the flavors seem to get more intense. They are not overpowering and it still maintains a refreshing quality but the flavors are stronger and spicier now that it has opened up a little. I’m going for an A on this one. It really is one of the most original and refreshing beers that I have ever had. I have a fond appreciation for the artistry and craftsmanship that blends together the subtle complexities of citrus, honey, lavender, and floral hops to create the most refreshing summer ale. What a tremendous experience.